The Intlock team will be heading to the sunny state of Florida for the Microsoft Worldwide Partner Conference from the 12th to the 16th of July, 2015. The annual conference allows for Microsoft partners like Intlock to gather together to connect, drive business, and learn about new profitable opportunities to work together. 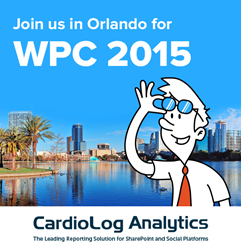 WPC' 15 will take place at the Orange County Convention center. Micorosoft partners from all over the globe will travel to Orlando to meet there. Numerous sessions will be held throughout the days with keynote speakers, breakout sessions and round-table meetings available for networking opportunities. As a Microsoft Partner, the Intlock team is proud to attend this conference and seek out new ways to provide the best possible solutions for enterprises leveraging Microsoft technology. Intlock has been a leader in the field of SharePoint analytics since 2005. The company's products - SharePoint Marketing Suite and CardioLog Analytics - provide comprehensive web-analytics and online marketing solutions for enterprise-level websites and intranet portals. Intlock delivers deep insight into the performance of organization's web and portal initiatives through testing, tracking and targeting, ultimately enabling users to optimize their site's impact and maximize the return on investment. One of Intlock's key strategies is partner alliances. Intlock believes that working together with partners is crucial for cost effectiveness and ease of implementation. Partner alliances shorten implementation times and enable the adaptation of Intlock's products to any technological environment a customer may have. Parties interested in a partnership with Intlock can contact the company: contact us and someone will gladly be in touch. Intlock is led by a team of experts in the fields of application development, knowledge management, web analytics, portal monitoring and control, and software engineering. Intlock's products and solutions are installed in organizations from various industries, including financial services, telecommunication, entertainment services and others.